Would you prefer an engagement bracelet over an engagement ring? Which well-known style icon wore an engagement bracelet? How can you personalise your engagement bracelet? What if she would like a wedding bracelet too? It’s tradition to ask your partner to marry you with a diamond engagement ring. But not all women enjoy wearing rings. Some women find rings tricky to work with, or perhaps aren’t even allowed to wear them for safety or hygiene reasons. In such cases the golden bracelet would present the perfect alternative for your marriage proposal. Even though it’s a very original and unique idea to get engaged with a golden bracelet instead of a golden ring, a well-known style icon actually already preceded you. No one other than Jackie was given a golden bracelet as an engagement gift by her John F. Kennedy. However, she did receive a traditional engagement ring first and the bracelet the day before their wedding. 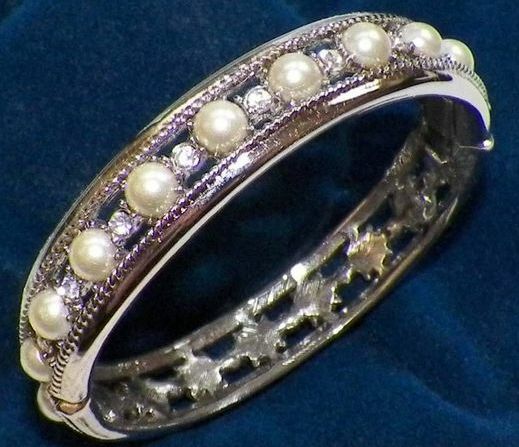 It goes without saying replicas were made of this beautiful white gold satellite bracelet with diamonds, which Jackie actually continued wearing her entire life. But you will undoubtedly be able to find an original alternative in the extensive collection of bracelets in order to write your own story. What would you say to having your golden bracelet engraved? A personal message, your names, a special date ... anything’s possible! After all, the 5 ways of personalising an engagement ring can also be applied to an engagement bracelet. And this personalising doesn’t need to stop once you have popped the question. Something can be added to your golden bracelet for every milestone in your lives. This can therefore become a collection of memories, which she can wear every single day. We have just had a detailed look at the possibility of an engagement bracelet, but a wedding bracelet is certainly also a great alternative to a wedding ring. A beautiful example of this is the golden bracelet worn by the Dutch Queen, and fashion queen, Maxima. She was given a link bracelet, where every other link is filled with a coloured gemstone, by her Willem Alexander. Do you like the idea of choosing a golden bracelet as an alternative to the engagement ring or wedding ring? Or are you looking for an alternative? Allow yourself to be inspired by BAUNAT’s diamond jewellery or contact the experts for extra advice.